John Hill is a co-author of Ultimate Trading Guide, an excellent trading book. The Yum-Yum Continuation Pattern I reviewed earlier is found in this book. John Hill has another lesser known book called Scientific Interpretation of Bar Charts. It is a concise manual with a chapter devoted to trading with trend lines – Trend Line Theory. In this review, let’s look at an elegant use of trend lines to find pullback trades found in the Trend Line Theory. Refer to the diagram below and start by labeling the points 0 to 4. Then, connect point 0 to point 2. That’s your 0-2 line (in green). Now, connect point 0 to point 4 for your 0-4 line (in red). 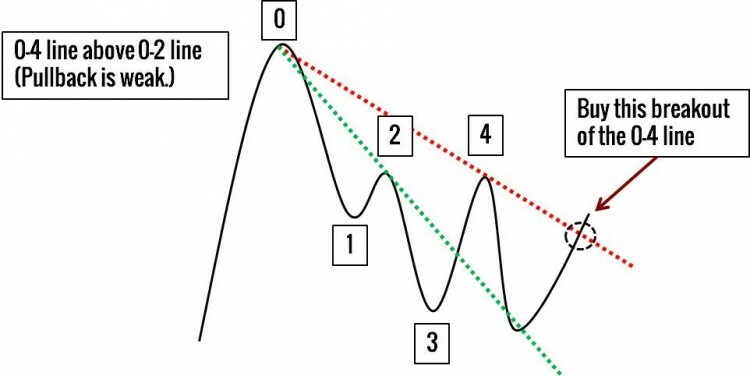 As we expect to trade deeper pullbacks here, an intermediate indicator period is suitable. Hence, in the examples below, I used the 50-period SMA (orange) to check the trend. I have also marked the price swings in blue to highlight the anchors of each trend line. MCD was below its 50-period SMA, trending downwards. Price started to pullback upwards. In the second leg up, there were four consecutive bull bars, a sign of strength. However, the trend line analysis produces a different conclusion. The 0-4 line was lower. This meant that, despite the upwards thrust, the bears were growing stronger. Moreover, there was resistance from the SMA. 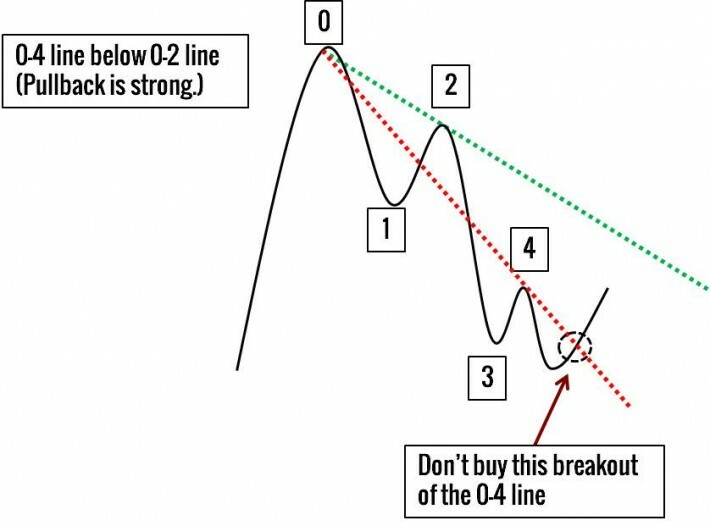 Hence, we sold as price broke below the 0-4 line. XOM was in free fall after a pullback to the 50-period EMA. 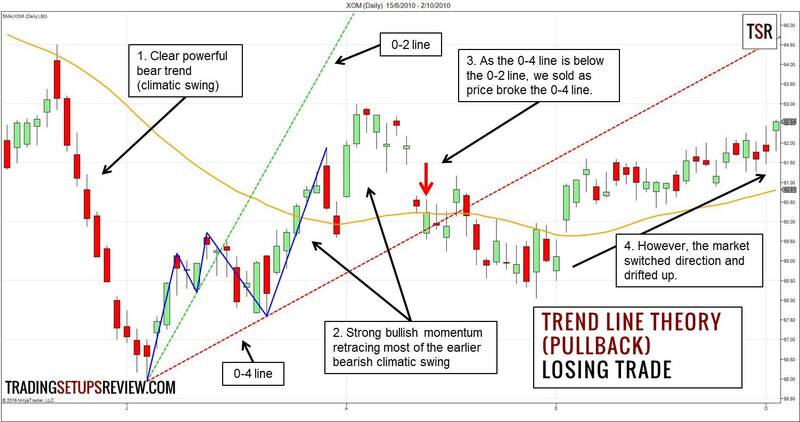 This pullback showed many strong bullish trend bars and great momentum. Moreover, it cancelled most of the earlier bear swing. As the 0-4 line was below the 0-2 line, the market prompted a short entry when it broke the 0-4 line. However, instead of continuing to fall, prices drifted up after some meandering. I’m impressed by this strategy. This is a clever way of using trend lines. Pay attention to the trend context, and you have a reliable pullback setup. In the examples above, I used what I call basic pivots in my course. Of course, it’s not the only method. Any method of marking minor pivots will do, but stay consistent. Thanks Galen! Great technique. I look at it as an enhancement to the higher-high / lower-low approach to trend identification. 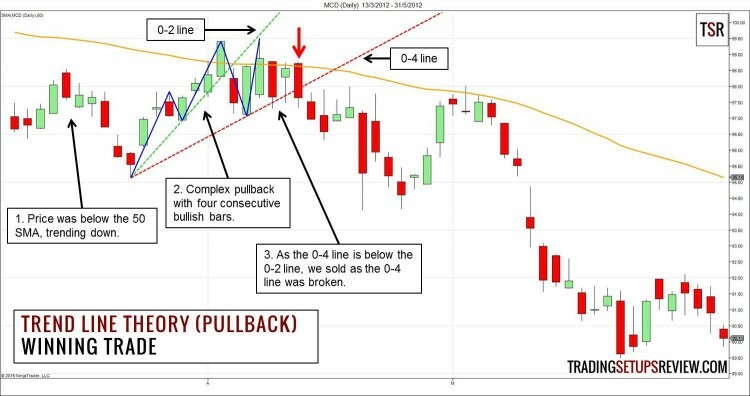 Using the slope of the retracement at the second pivot relative to the first to determine the strength of the pullback makes sense intuitively and this method provides a simple and definitive way to quantify that strength. Hi Ron, thanks for the comment. You’ve summarized this method succinctly. Really awesome, selflessness and thoughtful website Galen. Thank you for everything that you do. Thank you, DB. Hope to hear from you again soon.